If you’ve ever sat down to read through every piece of literature that comes out of a single company, you’d notice that there are differences. While the general language and terminology stays the same – after all, that’s branding for you – the tone, content and appearance change. 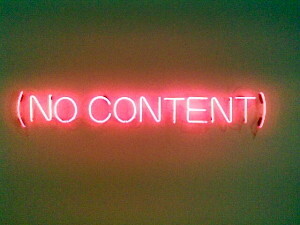 This is due to the fact that good content is geared to its purpose, and each piece of literature has a unique and specific purpose. This is the umbrella term for any form of content with a “marketing” bend. It includes Social Marketing, Content Marketing, Web Marketing and more. Marketing writing has a single purpose – to get the reader to take action. It doesn’t matter if it’s to go out and buy a product, or to click a link for more information. That being said, Marketing Writing can include informational, promotional, statistical and even technical writing. The different between it and the following types of writing is it’s purpose – action is required. This type of writing includes any content that is not meant to market a product: web sites specifically for informational purposes, brochures or articles intended to inform, not promote. Information without the desire to persuade or influence someone is covered in this category. The writing style tries to remain neutral and strictly informational (think Wikipedia), but can be creative and fun. The name kind of speaks for itself – most of this writing is technical. We’re talking product descriptions, instruction manuals, warning tags and care manuals. Need a guide on how to use your product? You’re looking for a technical writer. Also informative, technical writing and content writing sometimes overlap. The difference is in entertainment – technical writing is almost never entertaining, while content writing can be, providing it’s done well. This includes press releases, backgrounders, position papers, content for print and broadcasting, media kits, media pitches, speeches, presentations and more. The purpose of public relations writing is to tailor a message for a particular media and for the public; to inform the masses with information, research, trend analysis, predictions and more in order to counsel them into implementing a planned program or action that will serve their interest. Pretty dry sounding, right? It’s not, though. It is a useful tool that helps many businesses. This is the term for the memos, reports, emails and communications that happen within a company. Internal business communications have many authors and thus many different tones. The trick to business writing is to keep everything concise and organized, so that the reader (especially if it’s your CEO or President) won’t have to spend too much time reading it. Use headings, bullets and paragraph separators, as they pull the eye and make life easier. If you have any questions or need help with one of these styles of writing, feel free to contact me. I am more than happy to help.